As horse lovers ourselves we strive to offer Horse Transport Sheets made of exceptional quality which are made to last. This High Spirit Transport Sheet features a traditional horseman's plaid top with black rip-stop nylon on the bottom half. 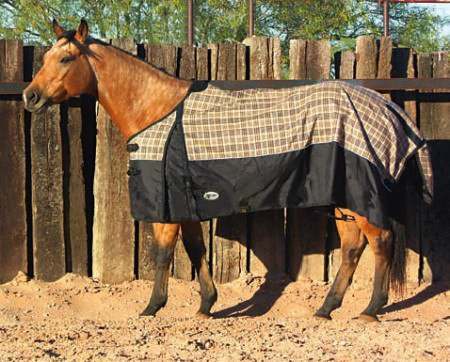 The Horse Transport Blanket comes with a fleece wither guard, reflective pipe edging at the top, and bound nylon edging. Comes with one surcingle at belly, two buckle closures in the front that come off easily, all of which is offset by sizable should gussets that allow for movement. All stress points are reinforced with sturdy leather grained vinyl. Also comes with two elastic leg straps and nylon taffeta. We know how hard it can be to find a great deal on a Horse Transport Sheet. This is why we offer all our Equine Transport Sheets at discount prices to help our customers save and want to come back.